Whether it's describing the pain of adultery in DOES HE LOVE YOU or the last days of a woman with AIDS in SHE THINKS HIS NAME WAS JOHN, SANDY KNOX has become well known for her ability to capture the feelings of real women in the words of her songs. This debut album features a collection of songs about life as a single, successful woman. This project is a reflection of SANDY KNOX's life. The listener is drawn in as if sitting beside her as she looks into the mirror, looking back on a life that has taken her from Houston to Nashville, where she became one of the top songwriters in the music industry. SANDY KNOX delivers these poignant messages with a deep, sultry and knowing voice. Her words and voice combine to create a powerful, emotional masterpiece that provokes laughter and tears. With $1,500 in her pocket and not a friend in town, SANDY KNOX moved to Nashville at age 24 to pursue songwriting. Three years later, she had her first song cut. Her big break came in 1993, when DIONNE WARWICK released WHERE MY LIPS HAVE BEEN as a single. That followed with REBA McENTIRE recording DOES HE LOVE YOU as a duet with LINDA DAVIS. DOES HE LOVE YOU spent three weeks atop Billboard Magazine's Country Chart. It also received a Grammy nomination for Country Song of the Year and garnered a Grammy Award for REBA McENTIRE and LINDA DAVIS for Best Country Vocal Performance by a Duo or Group. DOES HE LOVE YOU was also recognized by The Academy of Country Music receiving four nominations. It took the CMA Award for Vocal Event of the Year. 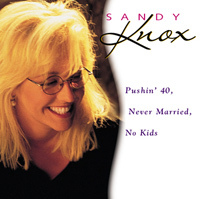 Some of the artists who have recorded SANDY KNOX songs are REBA McENTIRE, NEIL DIAMOND, PATTI LABELLE, LIZA MINELLI , DONNA SUMMER and DIONNE WARWICK. SANDY is on the list of 1000 WOMEN WE ADMIRE in Mirabella, a national woman's magazine. SANDY KNOX served on the Board of the NSAI (Nashville Songwriter Association International) for five years. Sandy lives in Austin now. She teaches a songwriting course at The University of Texas, and is on the Board of Governors for the Grammy Awards (The National Academy of Recording Arts & Sciences (NARAS).